Ten sophomores square off in Saturday’s $300,000 Risen Star Stakes, led by Rogue Romance, the morning line 3-1 favorite. The colt, who raced exclusively on turf before finishing third in the 2010 Breeders’ Cup Juvenile at Churchill Downs, has been training at Gulfstream Park since the first of the year. Rogue Romance, who breaks from the inside post in the 1 1/16 mile Grade 2 at Fair Grounds, went a leisurely 1:02 2/5 for five furlongs last Saturday. His sire Smarty Jones won the first two legs of the ’04 Triple Crown. His trainer Kenny McPeek saddled ’02 Risen Star winner Repent that later captured the Louisiana Derby. “We’re just as confident in this horse as we were with Repent,” McPeek said shortly after the post-position draw on Monday. His challengers include three that finished behind Wilkinson in the Lecomte on Jan. 22: Pants on Fire, the runner-up beaten a head after leading most of the mile and 40 yards; Action Ready, another five lengths back in third; and Justin Phillip, bobbled at the break that ran fifth and last. The buzz horse is the Neil Howard-trained Machen, early 4-1 second choice that drew post 6. 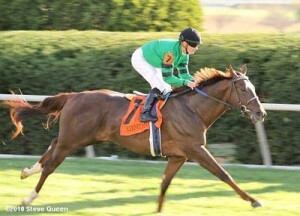 The son of Distorted Humor won both career starts at Fair Grounds last month. He debuted as the 3-1 favorite Jan. 2 at six furlongs and didn’t disappoint, winning by 5 ½ lengths. After going off at 1-20 on Jan. 30 in a first-level allowance race, he broke slowly, tracked a tepid pace and scored by five lengths at a mile and 70 yards. Machen worked twice this month, breezing five furlongs in 1:01 4/5 on Monday. Two others with a chance are Decisive Moment, victorious last month in the Jean Lafitte at Delta Downs after finishing second in the Delta Jackpot last fall, and Mucho Macho Man, a disappointing fourth in the Holy Bull last month at Gulfstream Park after two solid runner-up finishes last year in the Remsen and Nashua at Aqueduct. The Grade 2 was renamed in ’89 for the previous year’s Kentucky Derby-Preakness winner Risen Star, who captured the ’88 race when it was the Louisiana Derby Trial Stakes. On Sunday, a field of eight is expected for the $150,000 San Vicente Stakes at Santa Anita Park. Grade 1-placed Indian Winter, who won the San Pedro on Jan. 17, is stretching out from 6 ½ furlongs for his first route test. The son of Indian Charlie worked for the third time in February on Monday, covering five furlongs in a respectable :59 4/5 handily. San Pedro runner-up City Cool, who took Sunland Park’s Riley Allison Futurity at the same distance, breezed four furlongs in :50 2/5 last Sunday. So are two horses trained by Bob Baffert. The Factor set the Santa Anita record for six furlongs, breaking his maiden in 1:06 4/5 on Dec. 26. He won by 8 ¼ lengths in his second career start. The son of War Front earned a Beyer Speed Figure of 108, which equaled Uncle Mo’s rating for his Breeders’ Cup Juvenile victory at 1 1/16 miles. That’s the highest Beyer for 3-year-olds. The Factor on Monday posted a bullet 1:24 2/5 handily for seven furlongs over Hollywood Park’s Cushion Track. Baffert also will enter Jaycito, winner of the Grade 1 Norfolk at Hollywood in October before he finished seventh in the BC Juvenile. The only undefeated starter is Premier Pegasus, who recorded his second triumph in the Hollywood Prevue. The son of ’02 Kentucky Derby champ Fusaichi Pegasus breezed five furlongs in 1:00 2/5 at Santa Anita last Sunday. On Monday, the $250,000 Southwest Stakes at Oaklawn Park could feature a full field, including four that raced in the Smarty Jones. Caleb’s Posse won the mile contest, the same distance as the Southwest, by 2 ¾ lengths. Bluegrass Bull finished third, Archarcharch was fourth and the pacesetting Grant Jack ended up seventh and last. J P’s Gusto, based in Southern California until recently coming to Arkansas, is coming off a second-place finish in Hollywood’s CashCall Futurity after running sixth in the BC Juvenile. He won four stakes last year. Fabulous Rogue Romance!!! I love even his name. Too impressive racing horse. I would bet on that one everytime he races!